This class is about discovery. 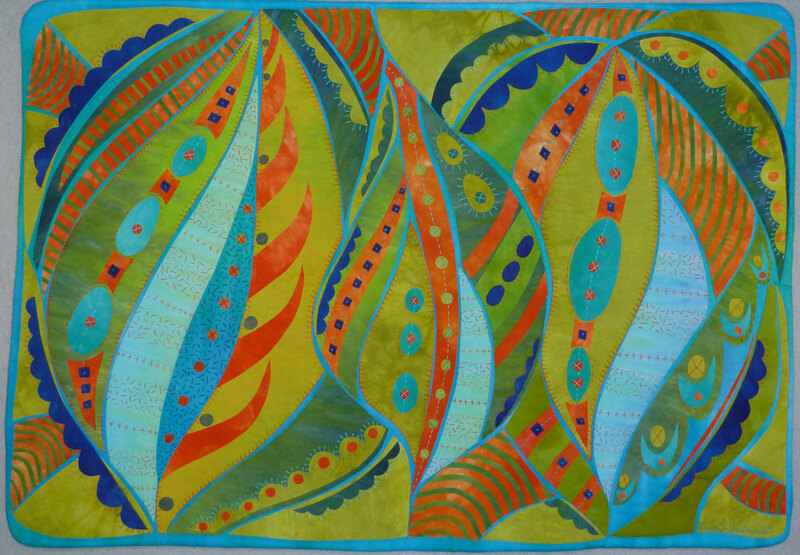 Laura will guide you in the creation of several small art quilts using fused fabrics and improvisational methods of construction. Your original designs then act as your canvas for improvisational hand embroidery. You’ll learn basic fusing skills and techniques for quilt construction and how to easily invent new designs through improvisation. You’ll learn how to hand embroider a fused art quilt and find how a well-placed stitch brings your quilt to life. Discover the joy of making multiple pieces of art with the ease of fusing and the delight of free-form, unfettered hand embroidery. $25 Kit Fee includes: hand-dyed fabrics, thread sampler, embroidery book, and embroidery needles. – Fabric:1/4 yard each of 8 different colors of washed fabric (yellow, orange, red, fuchsia, turquoise, blue, violet, green) DO NOT BRING FABRIC WITH A PERMANENT PRESS FINISH. Pick batik or hand-dyed fabrics. Hand dyed fabrics will be available for sale. – Size 3, 5, 8 or 12 pearl cotton embroidery threads in a variety of colors. Hand dyed threads will be available for sale. A student adds hand embroidery to her design.